On Wednesday August 1, 2012, the Judo Club hosted a farewell party for Assistant Sensei, Aziz Bendriss. 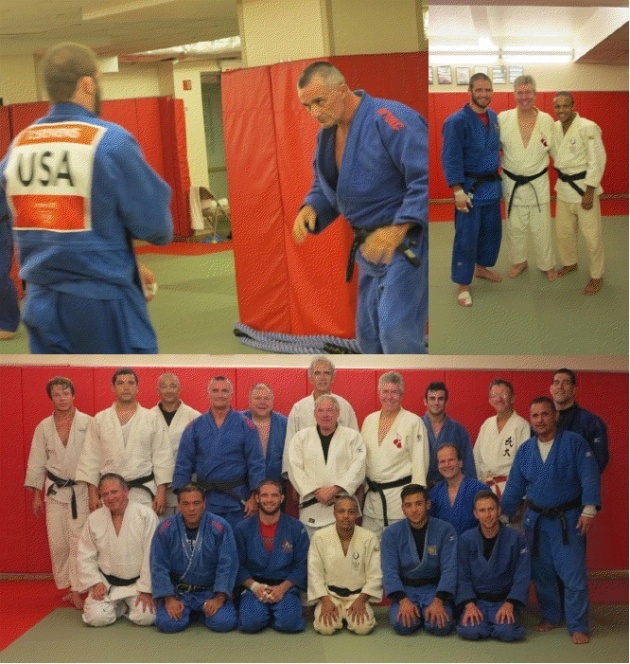 Aziz has been a member of the NYAC and the Judo club since 1985. 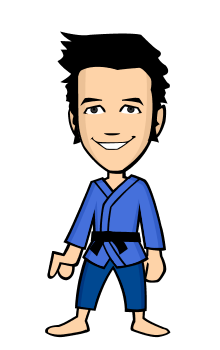 In addition to his position as Assistant Sensei and running the Monday workout, Aziz was the SMP sensei. He is taking a two-year leave of absence to assume the job of General Manager of a new five-star hotel in Morocco. We wish him good luck in his new position. Stay in touch with him at Aziz.bendriss@mhgc.com. Sarah Kaufman winces in pain as Rhonda Rousey arm bars her in 54 Seconds! 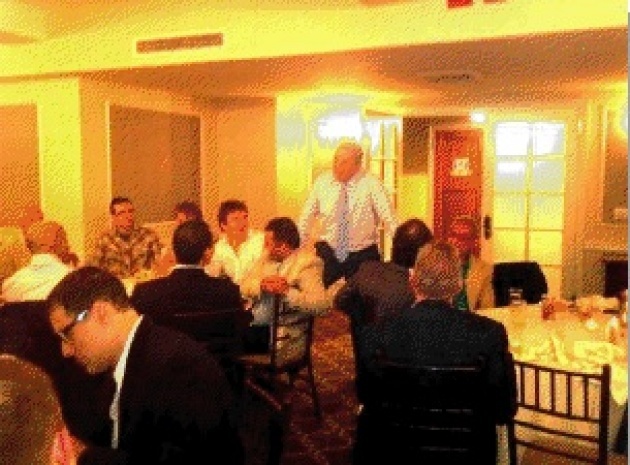 From left to right: Gene DeSouiza, past Athletic Chairman and Club Captain; Chris Skelley, US Olympic Judo Team Manager; Cedric Jones, the NYAC's Athletic Director; Kayla Harrison; Chris Cassell, the current NYAC Athletic chairman and Captain; Jimmy Pedro, Coach Team USA and NYAC Hall Of Famer; Travis Stevens; Andy Blumenthal, Judo Club President; Kevin Earls, Judo Club Co-Chairman. 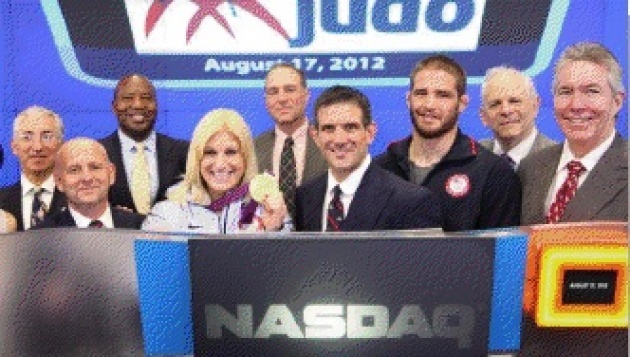 Kayla Harrison, the first American to win an Olympic Gold Medal in Judo, was invited to ring the opening bell at the NASDAQ on Friday, August 17, just two weeks after her triumph in London. In a brief speech, Kayla thanked her supporters and the NASDAQ for giving her the opportunity to control $3 trillion and then her coach and NYAC Hall of Fame member Jimmy Pedro thanked, first, the NYAC and then USA Judo for the support that allowed the US team to compete successfully against state sponsored athletes, bringing home a gold, a bronze (Marti Malloy) and a 5th place finish (Travis Stevens, 81 KG). The market opening was broadcast live on CNBC and shown on the 100 foot high Jumbotron outside the exchange, on 43rd Street and Broadway in New York’s Times Square. The U.S. Paralympic Judo Team has its best shot at a gold medal since the team's head coach, Scott Moore, took gold at the Games in 2000. The squad has several players who could climb the podium in London. Myles Porter, 100 kg, is a U.S. favorite to take the top spot. Porter took bronze at the 2012 World Cup Miami in the able-bodied division and bronze in the 2012 U.S. Open, also in the able bodied division. Porter took gold at both the 2011 German Open for the Visually Impaired and the 2011 Parapan American Games. The entire team, including Dartanyon Crockett, 90 kg, Ron Hawthorne, 60 kg, Katie Davis, +70kg, and Christella Garcia, 70kg, were members of the U.S. Parapan American Team. Hawthorne, Davis and Garcia were members of U.S. Paralympic World Teams. Davis took a bronze at the 2011 World Championships and a silver at the 2011 Parapan American Games. Garcia also took bronze at the 2011 Parapan American Games. 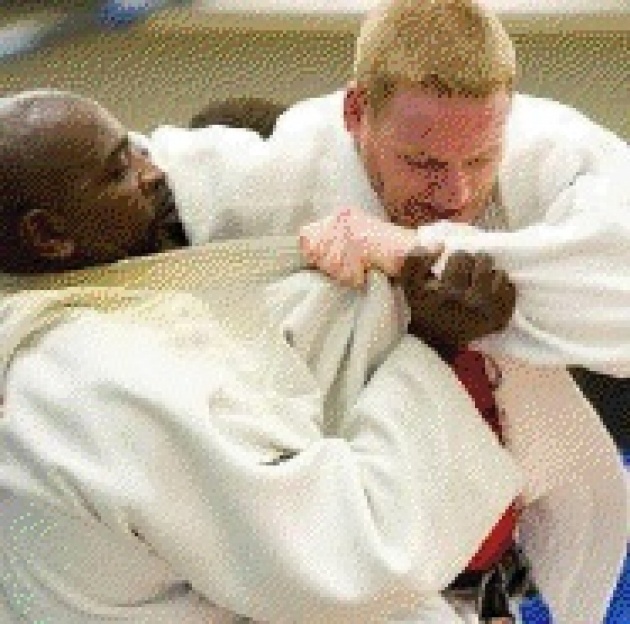 Judo is a sport that requires very few adaptations for athletes with visual impairments. Some of the toughest judo fighters in the United States, with or without visual impairments, are members of the U.S. Paralympic Judo Team, scheduled to represent their country at the Paralympic Games beginning Aug. 29 in London. Worth noting: some elite judo fighters practice with blindfolds to heighten and improve their sense of balance and momentum on the mats. By Ernest Pund, USA Judo Communication. On Wednesday, August 15, 2012, 2x NYAC Olympian Travis Stevens worked out at the club. 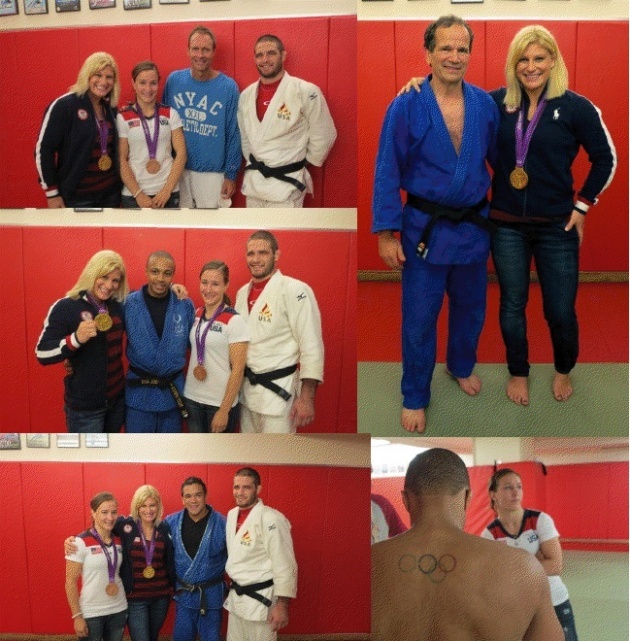 On Wednesday, August 22, 2012, NYAC’s Olympic Champion Kayla Harrison, Bronze Medalist Marti Malloy, and NYAC’s Olympian Travis Stevens paid a surprise visit to the club. After a standing ovation, a great workout (the ladies sat that one out), and a round of photo ops, the club members invited our Olympians to the Tap Room for dinner where we were entertained by some behind the scenes stories of The London 2012 Games. What a thrill! Aaron and RJ competed in the NY Open for many years. Our hearts go out to them for the loss of their father Irwin. I'm deeply saddened to bring you news of the loss of Irwin Cohen, one of our best competitors and coaches of all time. Irwin Cohen, my coach and good friend, passed away this morning following a 12-year battle with a rare blood disease. In the fall of 2000, the doctors and experts predicted Irwin wouldn't survive more than five months. Warrior that he is, he beat the disease for far longer. Please know that all donations are much appreciated to help the family in this terrible situation. These donations go to help the family for funeral costs as well as helping young judo athletes reach their Olympic Dream. Every top US competitor dating back to the 1970's trained with Irwin on their way to being a champion. Irwin's legacy reaches far beyond the judo mat, as the many hundreds of his students can attest to the success they achieved in every aspect of their lives, due in no small part to Irwin's loving and inspiring guidance. I am blessed to have been on the mat with Irwin for most of the last 12 years. Please join me in sending prayers and support to the Cohen family. May God's peace bring you comfort in this time of loss. Location: The Doral Country Club Resort and Spa, Miami Fl. Congratulations to the winners of the 2017 NY Open Judo Championship! Blog to earn higher rewards! To Judo or not to Judo?